This is a full-length documentary about a 14-acre, South LA community garden that was formed by the LA Regional Food Bank in 1992, just after the LA riots. The garden grew to become the second-largest distributor of free food to the urban poor in the US. The gardeners and the community were horrified when city approved the the destruction of the garden in an unpublicized city council session. The city had originally declared eminent domain in the 1980s to use the (privately owned) land to build an incinerator, but strong local protests against the incinerator won out. 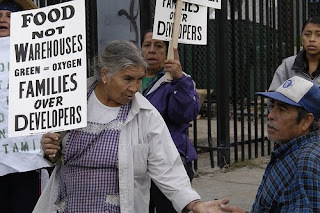 However, even though the incinerator project was defeated, the city still held eminent domain. The acreage was offered to the LA food bank, and the acreage was sub-divided into 360 individual gardening plots. In 1994, the city sold a small portion of the land, which broke the original contract with the property owner- he had contractual first refusal rights. The owner brought suit against the city, who eventually won back the land in an out-of-court settlement. And he decided he wanted to knock down the garden and build warehouses on the acreage. The garden thrived for 11 years; completely unbeknownst to the gardeners, some of it while the suit was under review. 330 families farmed those 360 plots, but the plots economically and socially supported large portions of neighborhoods, provided families with extra income, children with a place to play, and immigrant palettes with hard-to-find foods from their home countries (most of the gardeners were of Latin American descent). The garden was ultimately destroyed in 2006, despite star-studded protests and international media attention. Luckily, many of the gardeners have since found new plots. You can bring this movie to your neighborhood independent theatre- click on the contact link on the movie makers' website for questions about distribution. Be sure to watch the trailer. It's a movie that will make a food activist out of you! Now I see cities can't find enough patches of land for all the people who want to garden! Is the patio sagging yet? Has it been load tested for all the goods? You must have 1/2 a ton of tomatoes! We will keep our weathered eye out for the movie. There was an interesting article in I think the Saturday NY times about digless gardening; making a sort of lasagna with hay, straw, compost, blood meal and bone bone meal. Bunns- no tomatoes yet, since I live in the Great White North. But I DO have about 20 little green marbles that should become tomatoes by July 4. Madam D. Moll, I'm thrilled to notice that the no till method has been getting a lot of press lately, espcially in CA papers. It saves on water consumption by up to 90% and is about twice as productive. One of the earliest US-published books on the subject was by a woman named Ruth Stout. She was well into her 80s when she wrote it, and it's a real romp of a read- she was a spitfire. I think it was written in the early 1970s. It's quite a book- sort of thin on info, but Ms. Stout herself is something to behold. So sad and unbelievable. So much more is lost than just the food produced, as you say. Whole connections of people helping people, making difficult lives good, sharing and caring, a sense of belonging and children growing up knowing how to fend for themselves by growing food. None of this can be provided any other way and forms the very basis of a civilised society. Without all these things people fall btween the cracks and lives become fruitless again.Crime and violence increase and money is spent on police and court cases and lives are ruined. So, what is the point?